Change your thoughts and change your life! Whether or not you believe that what you hold in mind determines your future, there’s no question that your thinking does effect how you feel in the present. 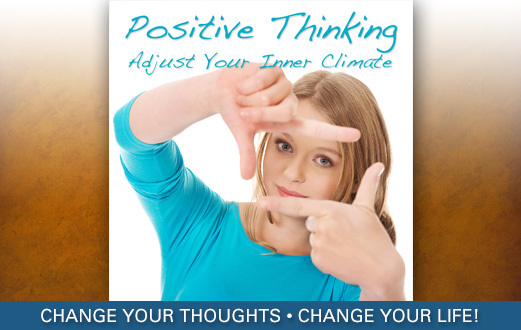 Use this program to make a shift and Adjust Your Inner Climate. Cleaning up our inner environment is a great idea, but changing our thinking is not easy. The intellect is like a computer, and tends to respond to the way it’s been programmed, and negative thinking is a pattern that most of us find difficult to break. Inner Alarm Clock: Recognize the moment we’re in negative thinking. Remote Control: Switch to positive thinking easily and quickly. The techniques are simple to learn and use, and draw upon positive imagery from your own life that’s already meaningful to you. If you’ve wanted to make changes and think more positively, but find yourself stuck in a rut of negativity, Positive Thinking can help you. "…observe yourself in the world below, in a typical situation in your daily routine, as you’re engaged in a neutral or positive line of thought. Imagine the colors in your energetic field, and you’ll see that they’re clear, beautiful, and bright. Imagine the vibrational sound within your field, and you’ll notice it’s gentle, resonant, and harmonic. And observe the feeling that seems to permeate your being, and notice that it’s warm and uplifting. Now observe yourself as you’re engaged in a negative line of thought. Imagine the colors in your energetic field, and you’ll see that they’re dark, muddy, and unappealing. Imagine the vibrational sound within your field, and you’ll notice it’s harsh, dissonant, and unpleasant. And observe the feeling that seems to permeate you, and you’ll notice it’s abrasive and uncomfortable. You’ve just gotten a brief glimpse into the way your thoughts influence your inner climate. Now you’re going to do something that will help you make a shift…"
"Every one of us is subject to negative thinking, and if you think about what you think about, changing it can seem like a daunting task. In the same way I like to live in a home and work in an office that's an uplifting place to be, I like to keep my mental environment positive, and uplifting. But there still are plenty of times when I find myself in a negative train of thought, so I developed something like an "inner remote control" that I use to make a switch, when I find myself in 'stinking thinking'. I've programmed scenes into my own remote control that I find especially inspiring and uplifting, and can call them up in a matter of seconds when I need to. "In this guided meditation program I share that technique, as well as another I developed, to help us recognize when we're in negativity, something like an inner alarm clock. Now I have no excuse to not have a nice clear inner climate, and if you use this program, neither will you! I hope you'll try this guided imagery program yourself, and let me know your experience. I think you'll agree it's helpful."